Home builders got a bigger lift than many expected from this year’s spring selling season, with new-home sales rebounding strongly from the industry’s lackluster 2014. The 233,000 new homes sold in this year’s first five months amount to a 24% increase from the same period a year earlier, according to Commerce Department data released Tuesday. March, April and May traditionally are the three biggest months for new-home sales. That rebound has been a long time coming. U.S. home construction boomed from roughly 2004 to 2008 amid lax mortgage-qualification standards. It then cratered from 2009 to 2011, hammered by the foreclosure crisis and a scarcity of credit for home builders and buyers alike. The housing recovery since 2011 has been rocky in the short term and frustratingly slow in the long term. Builders still have ground to make up: Even with this spring’s surge, the market’s pace of sales in May—546,000 homes annually, when seasonally adjusted—amounts to roughly 75% of the average annual pace from 2000 to 2014. But this spring’s healthy gain is welcome for many builders after the flat spring of 2014, which was soured by job growth that hadn’t yet hit full stride and buyers’ resistance to rising prices. Any pickup in home construction stands to benefit the overall economy, given that construction of single-family homes has been anemic in recent years. Home construction historically has accounted for 5% of U.S. gross domestic product, but it has hovered near 3% for the past year, according to the National Association of Home Builders. Several factors have coalesced this year to bolster home sales. Job growth has gained significant momentum, with employers collectively adding more than 200,000 jobs in 14 of the past 15 months. That has created a new population of potential home buyers. Lenders slowly are making more construction loans available, and some mortgages now are slightly less expensive due to recent reductions in the annual fees charged on Federal Housing Administration-backed loans. Another potential source of momentum heralded by builders of late is the nascent return of entry-level buyers, who were sidelined in the recovery by slow job and wage growth and tight mortgage-qualification standards. Multistate builders that recently reported more entry-level sales include D.R. Horton Inc., Lennar Corp. and Meritage Homes Corp., which started a division this year to cater to that segment. KB Home on Friday reported that 56% of homes it sold in the four months that ended May 31 were purchased by first-time buyers, up from 50% in the previous quarter. KB Home CEO Jeff Mezger called the market’s apparent increase in entry-level activity a potential “turning point” for the housing market’s recovery. FivePoint, a joint venture of Mr. Haddad and Lennar, has developed communities in the Bay Area and Southern California. In FivePoint’s Valencia project in Santa Clarita, Calif., builders sold 265 homes from January to May of this year, up from 231 a year ago. In Tavistock Development Co.’s Lake Nona community near Orlando, Fla., builders sold 242 homes in this year’s first five months, up from 194 a year earlier. 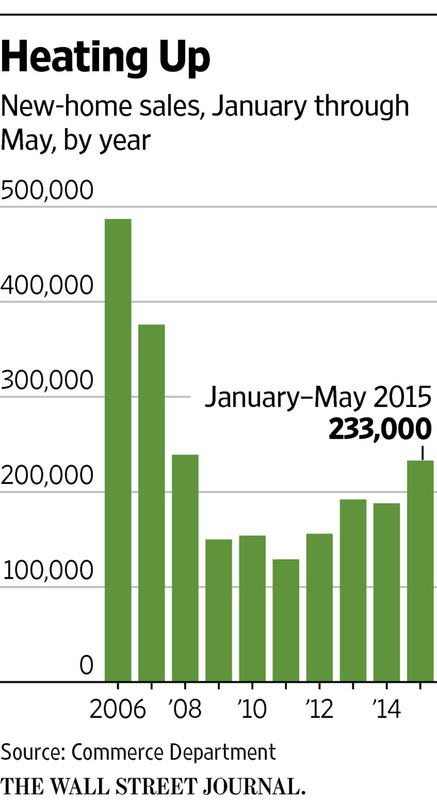 Many economists and builders see new-home sales continuing to improve. But they add that a few factors still could weigh on the market. Interest rates, for example, are expected to rise later this year. Weekley Homes’ sales so far this year are outpacing the year-ago results by about 10%, Mr. Johnson said. Joseph LaVorgna, chief U.S. economist for Deutsche Bank Securities, posits that new-home sales will gain momentum if builders construct more homes to be completed or near completion when buyers come looking. Many builders have eschewed such speculative construction since the downturn wiped out overextended peers. Builders had 206,000 completed homes listed for sale at the end of May in the U.S., up from 194,000 a year earlier, Commerce data show.